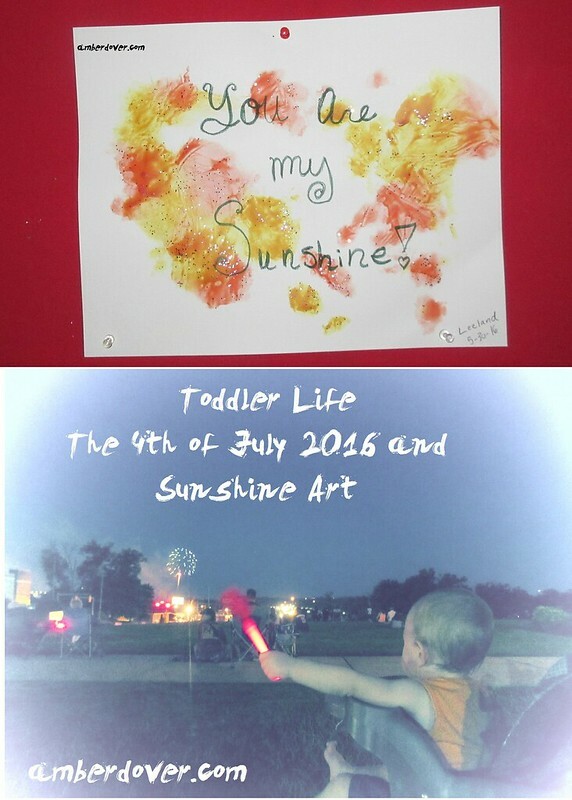 In this post: Leeland’s second Fourth of July and Sunshine art. Hello, dear ones! This will probably be one of my shortest posts. I’m working on several other posts for the future, though. I just wanted to share Leeland’s second Fourth of July celebration. This was his first time really enjoying fireworks. He wasn’t scared at all. I bought the kids glow stick toys. Leeland’s toy claps. Edit* I almost forgot the patriotic toddler book we found at the library. Here it is! We’ve also had fun with paint. Leeland painted this Sunshine art. I squirted yellow, red, and, orange on the paper then covered it with plastic wrap. Leeland used his hands to push the paint around, and the best part…no mess! I added glitter and the saying. I love the song “You are my Sunshine”. My Granny sang it to me and I call her my Sunshine. Now, Leeland has this on his wall. In other news, we are still enjoying our Summer. Michael starts 6th grade at the end of August. We have a school house outside now, and I plan on sharing that post soon. I have several 5th-grade posts to share, and I plan on catching up on them before I start sharing 6th-grade plans. We’ve pretty much finished our Summer bucket list, and I hope to share that before August ends. Anywho, you can find more Toddler fun at the link below. I’ve posted several sensory play ideas. Don’t forget to check out Life with Baby posts too. I’ve got a few left to catch up on, but there are already many neat ideas from then. You can also connect with me on my youtube channel. We’ve got some fun videos and I hope to add more to my Vlog in the future. I’m really happy with my Second Life short movie, Alice’s Dream. I hope you check it out! Thanks for encouraging me with your presence.